Keep your child’s smile healthy by accessing preventative dental care when they’re young. We recommend scheduling your child’s first visit by the age of 2, with regular checkups every six months to intercept concerns in their teeth and gums as early as possible. 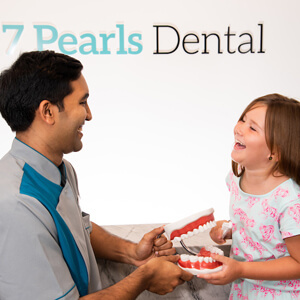 Our family friendly dentist and team are committed to ensuring a positive experience for every child, keeping appointments comfortable and fun. The more accustomed your child becomes seeing the dentist, the less nervous they will be about dental care as they grow up. Routine checkups, cleans and protective fissure sealants can help your child enjoy a cavity-free smile for years to come! When Should Your Child First See a Dentist? Most dental and medical paediatric specialists recommend bringing your child in for their first dental checkup by their first birthday or when their first tooth erupts; whichever comes first. We prefer to see your little one by their second birthday! At this age, we can keep things fun, comfortable and yet instil a great perception of what it’s like to see a dentist. At 7 Pearls Dental we accept the CBDS. The Child Dental Benefits Schedule (CDBS) benefits include up to $1000 in dental services (such as exams, X-rays, cleanings, sealants and extractions) over two consecutive years. Children between 2-18, who are covered by Medicare benefits, usually qualify. As we monitor your child’s growth and development, we’ll share techniques that promote effective oral health, including smart nutritional choices that reduce the risk of developing problems like tooth decay. Depending on your child’s age and comfort level, we’ll take a few X-rays to evaluate tooth development and alignment as well as screen for possible infections. A scale and fluoride treatment will help keep their smile clean and reduce the risk of cavities. Children can quickly pick up on anxiety from their parents; it’s important to discuss things in a positive light, so as not to accidentally add to the possible fear of seeing a dentist. 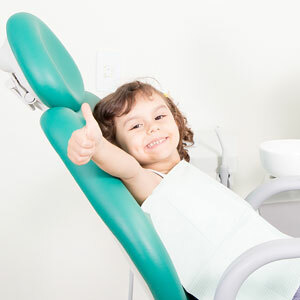 If your child requires treatment, we offer comfortable sedation dentistry (happy gas). Until your child can tie their shoes, we recommend that as parents you should help them brush and floss each day. Encourage your child to care for their teeth independently but follow up behind them to check that everything is cleaned well. Encourage your child to brush in a circular motion across all tooth surfaces and gumlines for a minimum of two minutes, twice per day. Use a strand or pick-style floss to clean between teeth each night before going to bed. Select appropriate snacks and drinks that promote healthy tooth development, such as milk, cheese and fresh produce. Between meals, recommend water over other drinks to limit tooth exposure to natural or artificial sugars. Did you know that lip lacerations, chipped and broken teeth are among the most common sport injuries? 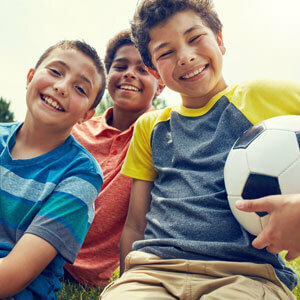 If you or your child are active in sports, we’d like to recommend protecting your smile with a custom fit mouthguard. At our practice, we’re proud to offer this quick in-chair solution in just a matter of minutes. Our office is open seven days a week to make it convenient for everyone in your family to get the care they need in one location. Contact us today to request your child’s first checkup!